Striving for a garden yet struggling to get enough sunlight? Bring beautiful, blooming, bountiful flowers that thrive in the shade of your garden with Shade Flowers & Plant Mix Seed Stones. Rolled in Artesian clay to preserve their freshness and longevity, these seeds are guaranteed to grow. Just drop them onto the soil, water them, and let them flourish all on their own. Containing 27 types of flowers and plants, this is a delightful addition to any shady spot in your garden or yard. 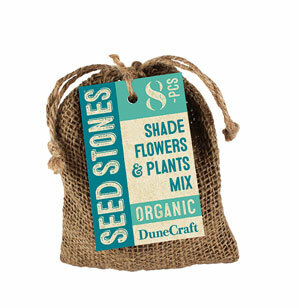 Perfectly prepared and easy to grow, this exclusive Seed Stone set will quickly turn any brown thumbs green, beautiful, and growing. They make a great gift for anyone, including yourself.